Take your partner to the beach and write "Will you marry me?" in big letters in the sand. Ask a baker to make a cake with the proposal written in frosting. Have him display it in the storefront and suggest a little window-shopping. Go to a cinema with her with two tickets, but before you enter the hall, pretend you just lost the tickets and than pull out the engagement ring instead of the tickets and ask her if she will like that instead. Create a web page all about your life together. Photos, places that mean a lot to you etc.. Announce your love by proposing, send him the web address and wait for his/her reply and when accepted you can then send the address to friends and family. Crowded restaurant - make the big announcement!! VERY CHEESY but always a good story to tell! Remember, the best way to propose is by understanding what she really loves. No matter how simple you want it to be you can still make it special, it doesn't have to be public to be special. It’s never good to get your girlfriend feeling squirmy and sweaty in the middle of your proposal. If your girlfriend’s a private person, then plan a day which both of you can spend by yourselves, and make sure it’s just the both of you. A great marriage proposal doesn't have to be expensive or extravagant. 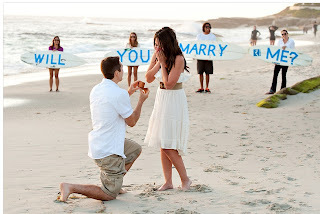 Many women are more likely to cherish the memories of a proposal that was inexpensive but truly creative. The creativity is what makes the proposal so memorable and what makes it a great story to tell their friends.